Thanks to everyone for following along on this nearly-year-long journey back in time. It is with some sadness that this series comes to a close. December 13th was the last entry, as the small pocket journal was at its last page. The past year has been a great glimpse in the day-to-day life of the Greene County Pioneer Bolton Family. As we read Lee Bolton’s daily entries, we saw the culmination of a cooperative effort to bring telephone service to Cedar Township, a first hand account of the aftermath of the Swearingen Tragedy in Jefferson, as well as the gradual improvement of the transportation system of county roads. My daughter Sarah and I were happy to share this little piece of family history with interested parties. Thanks again for your participation in this endeavor. Journaling is important, no matter how “boring” you think your entries may be. It is because of this journal, I was allowed to learn about my grandfather who was 110 years my senior. While I never met him in life, I feel that I know him. If this journey has taught us anything, we should know to document our life. You never know who may be reading it 111 years later. This has been the finest day for nearly two weeks. I have been chopping wood on the “forty” all day. Yesterday Henry and I put the fence in order around the north piece of Peacock’s stock pasture. Has been a very fine day tho a raw wind has blown all day from the N.E. We spent the day in sawing wood in the yard. Harve took a cord of wood to Perkins’ which I sold while in town yesterday. Yesterday I took a load of wood to K.H. Holloway. As I have made no entries since the 3rd, the record of last week has been somewhat neglected. The weather being excessively cold, little was done save some necessary chores and they were not well done. The weather has been very severe for so early. Friday evening we all went over and spent the evening at Ritchie’s, returned at midnight under a clear sky. In the morning it was snowing and kept it up all day. In the evening I called McCoy to treat a sick cow which died Sunday evening. A very bad day for anything. Yesterday began with a light rain which continued until evening when it started to snow, and kept it up until this morning and now, a strong wind having blown all day from the North; it is very cold. This morning I met Toyne at the bridge and we measured the grade. 264 yards @ 16.00 (16 cents for moving a cubic yard of dirt) $42.24. In the afternoon I went to town and bought some footwear. A remarkably fine day for this time of year. I finished the grade at Cedar Bridge today. The sky has been overcast nearly all day and now at ten o’clock it has been sifting soft snow which melts nearly as fast as it falls. 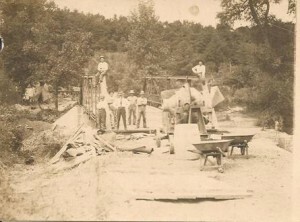 I worked on the grade in the forenoon and in the afternoon went with Henry to attend the sale of some old bridge material. I finished the East fill tonight. The task has cost me nine days, tho I have lost about a day (due to weather) which would cut it down to eight d’s. Last night brot the first real taste of winter. A little snow and a big freeze so of course the ground plowed quite hard today. I made very good headway on the grade today: expect to finish the East end tomorrow. Yesterday the old bridge material was sold. Have put in a full week on the grade to approach of Cedar bridge tonight. Have been able to get out at the bridge nearly all afternoon. Now have a fifteen foot grade on the East end. A fine day, a strong south west wind has blown all day. Tonight the sky is overcast and I fear for the weather. Harve went to Dakota today. I began work on the fill at Cedar Creek bridge. ©2010 - 2011 Sarah Bowman and Michael Bolton. All Rights Reserved. Please contact us for information on syndicating or using our material.